Power to Change is an independent charitable trust that supports and develops community businesses in England. With an endowment of £150 million in 2015 from the Big Lottery Fund, Power to Change helps local people run community businesses. In May 2017 Power to Change commissioned Giuseppe Sollazzo and myself to look at pockets of activity where data assets are being used locally. When we met to discuss the project, Gen Maitland Hudson, who heads up Data and Learning at Power To Change, explained that they already had a good sense of the kinds of problems that people face when trying to use data at a local level, but were less clear about what data is already being used, and the extent to which it provides reasonably reliable information. Power to Change wanted to learn more about what is already happening around community data use, to help inform the targeting of future support. Giuseppe and I both have extensive networks and, between us, know lots of data practitioners across a range of different sectors and locations. We drew up a long list of people to talk to, which we narrowed down to those we knew were actively using data at a local level. We then spent several months over the Summer conducting interviews. We originally anticipated interviewing around a dozen people, but ended up speaking to more than twenty to try and get a good cross-section from different sectors and locations. Having completed the interviews, we wrote up our notes, pulled the various strands together into a spreadsheet, and tagged the conversations with a set of meaningful keywords and dataset names. We then analysed the results, and identified a number of common themes and a few similarities among organisations. 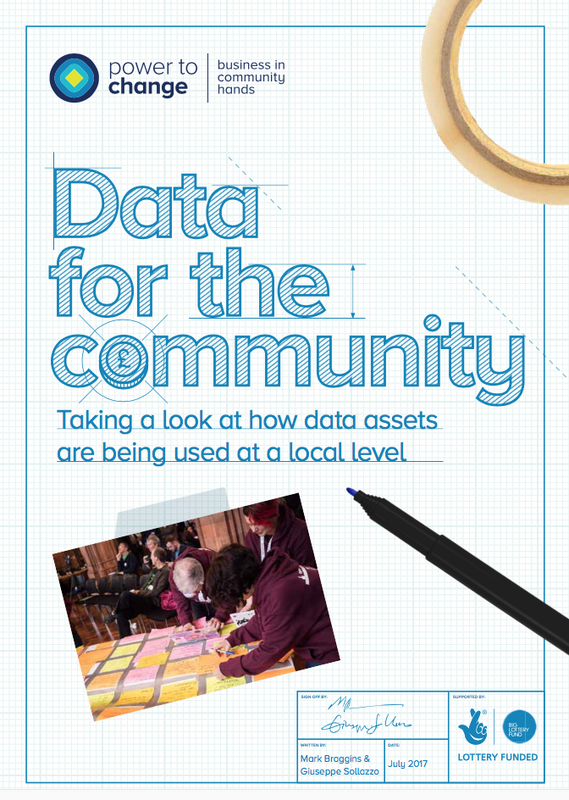 Our report: Data for the Community, which was published today, uncovers pockets of activity around data, highlights some areas of difficulty, and identifies some good practices which may be useful to community groups wishing to produce and use good quality information about their neighbourhoods. This entry was posted in Data, Open Data, Uncategorized and tagged community, data, local data, open data, Power to Change, research. Bookmark the permalink.